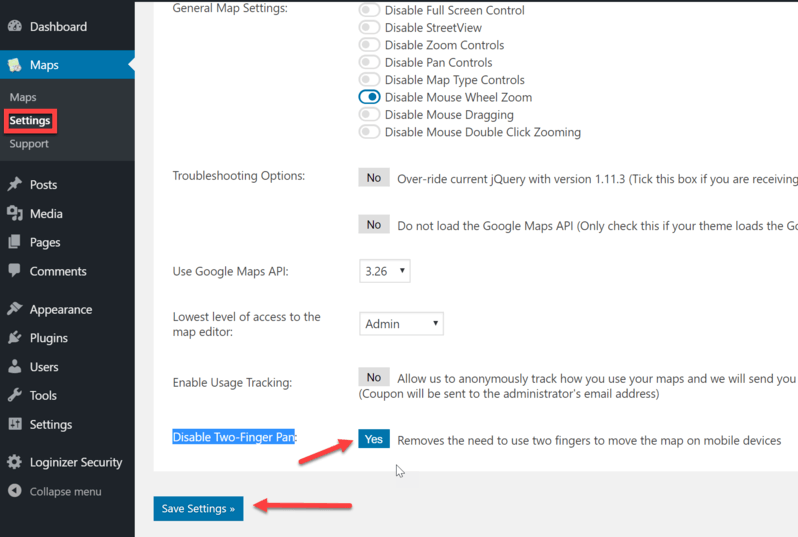 This article covers scrolling & panning your Maps on mobile devices with WP Google Maps. This article is based on WP Google Maps v6. WP Google Maps uses 2-finger scrolling and panning on mobile devices by default. To scroll a Map on a mobile device, press and hold with 2 fingers and move the Map in the desired direction. To change the Zoom level, press with 2 fingers and spread your fingers to zoom out or bring them together to zoom in. You can change the default panning behavior, allowing Users to use only 1 finger for panning. Go to WordPress Dashboard → Maps → Settings → Maps. Scroll down to the bottom of the Page and click the toggle button next to Disable Two-Finger Pan. Then click the Save Settings button. This removes the 2-finger requirement and the Map will pan with just 1 finger. This article covers scrolling & panning your Maps on mobile devices with WP Google Maps. If you need further assistance or are having other issues with the plugins, feel free to visit our Support Desk.